Why does hair get dirty? 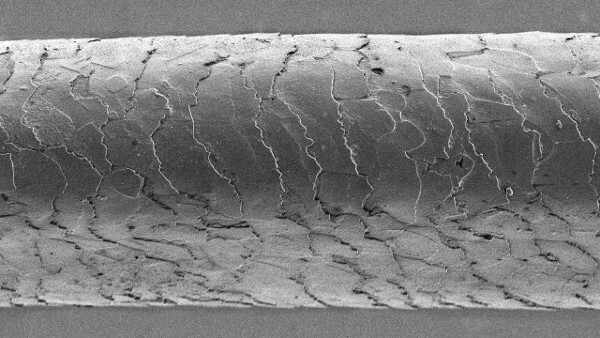 The shaft of hair is made of an insoluble protein called keratin (the same as your fingernails) covered with an overlapping layer of dead cells called the cuticle. In healthy hair, the cuticle is tightly wrapped around the hair shaft. In damaged hair, the cuticle is more open and ragged. The hair is also covered with a oily, waxy substance called sebum. This is produced by your body and helps to smooth the hair, give it shine, decrease friction, avoid tangling, and minimize frizz. Being greasy, sebum collects dust and dirt from the environment leaving your hair looking lifeless. Shampoo, or any other detergent, is very good at stripping away the sebum with the dirt from your hair. Detergents work because the molecules have two sticky ends: one end attaches to the water molecule and the other to the grease. When you wash out the shampoo it pulls away the grease with it. Without sebum coating the hair, the hair rubs against itself and generates static electricity which leads to “fly-away” hair. As well, the thin coating of sebum helps to keep the cuticles closed. When you apply conditioner after shampooing, it coats the hair with a thin oily substance having a similar effect as sebum. How does a 2 in 1 shampoo and conditioner know to remove the dirty waxy coating and apply a new clean waxy coating? How can it know which oily substance to remove and which to leave behind? This is done with some clever chemistry. 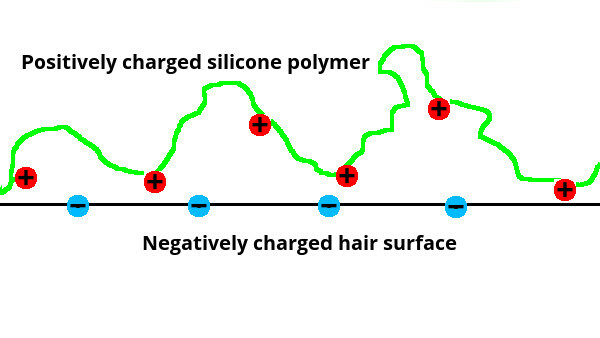 When hair is wet and stripped of sebum, it has a small negative charge (we say the hair is anionic). The conditioner in the shampoo has a small positive charge (we say it is cationic). As the shampoo and sebum and dirt are rinsed from the hair, most of the conditioner in the 2 in 1 is washed away as well, however, a small amount clings to the hair because of electric charge attraction. The most common conditioning ingredient in 2 in 1 shampoos is dimethicone. Dimethicone is an organosilicon polymer commonly referred to as a silicone. A polymer is a molecule made up of smaller, repeating units. Dimethicone is used in many cosmetic products, including shampoos and conditioners. Other common silicones found in shampoos and conditioners are amodimethicone and cyclomethicone. These compounds are also used in products used to detangle and defrizz hair. While 2 in 1 shampoo and conditioner work well. You will always get better results through the two step process of first washing with a shampoo and then applying a conditioner. Washing your hair strips it of its oils (and accumulated dirt). Conditioning restores oils to your hair. Dimethicone, amodimethicone and cyclomethicone are common oils used in hair conditioner. Sebum is an oily, waxy substance produced by your body. Wet hair has a slight negative charge.